Our Haena Cottage is perfect for a honeymoon or a romantic getaway. Experience the incredible beauty of the north shore from our 1 bedroom, 1 bath, 1100 sf beach home. Located upstairs, wrap around glass overlooks the beach just 120 steps away. Directly behind is lush jungle hillside, the border to 1000's of acres of private nature conservancy land. All tucked into an secluded, kamani tree lined cul-de-sac between the Wainiha and Haena neighborhoods. Our Home uniquely blends the “Old Hawaii” flavor with all the up to date amenities and comforts. The great room and large lanai have 270 degree panoramic natural views. The gourmet equipped kitchen has everything a discerning chef will need. Each room has lovely, stylish island decor. Included is an airy king Bedroom with bath, and a small separate office. Grill fresh fish on the gas BBQ in the ocean breeze on our 400 sq ft lanai. There is a separate laundry and and beach gear is provided. We are located in the heart of the most beautiful 10 miles of the island, close to Tunnels Beach, and set between 2 of the top 5 rated beaches on the islands. You can walk the beach the entire final 2 miles to Ke’e, where the road ends and the famous Napali coast begins. Or you can stroll the beach just 300 yards to the Hanalei Colony Resort, for the only (award winning) restaurant and coffee house on this part of the island. Or just take our beach chairs and head out the few steps to the beach out front! 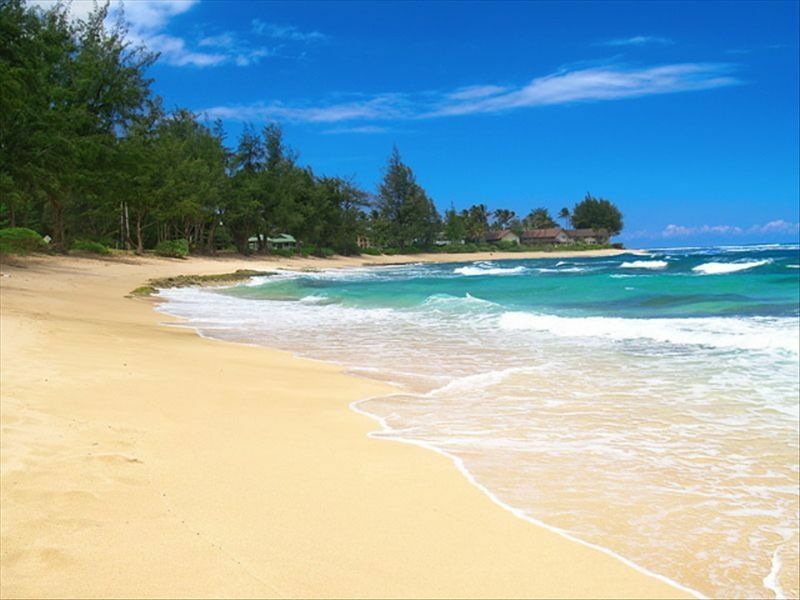 We are an approved Kauai Vacation Rental TVNC #1051. About the owners Doug, Bev, Miranda, and Katie Howland: Doug and Bev were first drawn to Kauai in the early 80’s, after many visits they finally decided to buy this wonderful property in 2006. Doug, a 35-year designer/builder, has spent the last 10 years personalizing the house. Bev, a jack-of-all-trades, has owned a health food store, opened a charter elementary school, run a motel, and managed their various properties over the years. Their youngest daughter Katie lives in Portland with her older sister Miranda. After a career in the arts, Katie now manages the family’s properties. Doug and Beverly now migrate between their properties in Arizona, Utah, and Hawaii. They like to hike, horseback ride, ski, practice yoga, whitewater raft, dance, and travel in their free time. They also have vacation rentals in the Escalante Canyons of Southern Utah and in the town of Sedona in Northern Arizona. Doug and Bev were always drawn to the North Shore, when making the decision to put down roots, they couldn’t resist the best part of the island. They fell in love with the unique beauty of their home that balances both accessibility and seclusion. There are many amazing natural wonders right out the front door (see above). This home offers the lush mountainous jungle of Kauai out the back door and the soothing beach and ocean out the front door. Great location, great rental. Only issue was dirty dishes. We loved the location and the rental. It had all the amenities we needed. I'd give it four stars for these attributes. The only issue were the dishes. Every dish/glass/wine glass/silverware/pan we took out of the cupboard was dirty. Some even still had pieces of food stuck to them. We had to hand wash everything we used for cooking and eating. The rest of the apartment was very clean including the kitchen counter/sink/stove/refrigerator. It was obvious whoever cleaned prior to our visit did not wash any dishes or inspect the ones that had been washed by the previous renters. I cannot express enough how sorry I am that your experience at our home was anything but outstanding. Patricia our property manager takes great pride in the cleanliness of our home and was devastated to hear there was an issue. If you are ever in anyway unsatisfied with the cleanliness of the house we are always willing to come back and address any issues right away to avoid anything effecting your stay. It sounds like our dishwasher is not properly cleaning the dishes and we are looking into replacing it as soon as possible. Having said that we make no excuses and just sincerely apologize for our oversight in checking the dish-ware in the cabinets. Again I want to express my apologies. I hope you will give us another chance in the future to show you that we take great pride in our home and the experiences of our guests, and that we have taken your feedback to heart to improve for the future. We loved our stay in Haena! The home is situated just a few steps from a secluded beach and we were able to walk to tunnels beach to do some of the best snorkeling! You can hear the ocean waves all day and night- so relaxing. My husband and I love to cook, and the kitchen was large enough for us to work perfectly together for our dinners every evening. The bedroom is a comfortable size with a walk in closet that is perfect for 2 people’s belongings. There are so many great things I can say about this place. What a wonderful experience- we will definitely be coming back! Thank you! Our time in Kauai was very rainy, but we loved being there anyway! This home is beautiful, somehow both grand and cozy. We love being surrounded by green, and being so far north. It's easy enough to drive in to Hanalei or Kilauea for lunch and the proximity to the beach is perfect -- right down the driveway! The perfect accommodations for a quiet get-away on the laid-back north shore of Kauai. The cottage is fantastic and lived up to all of the reviews that I read before making my booking. The home is well cared for - everything is clean and tidy. The kitchen and bath are well-equipped and in good working order. You don't need to bring anything but your normal suitcase and groceries. The bed is very comfy with plenty of pillows and blankets. Good wifi, TV and cell service if you need to stay connected. The living area is big enough for six people, but there was just the two of us. There is also a large covered lanai (porch) that looks out towards the ocean. It has a nice table, lounge chairs and a grill that we used a few times. Great laundry downstairs with two sets of machines. There is a separate rental in the lower portion of the cottage and a small separate garden cottage that shares the property. There were other couples staying in those places and but we all did our own thing and rarely saw or heard each other. I imagine if you had a larger group you could rent all three and spend evenings in this larger upstairs living area. The owners have a local manager, Patricia, who was fantastic. She was very responsive to our requests and is very friendly and knowledgeable of Kauai. We loved the quiet , laid-back atmosphere of Ha'ena. The scenery is beautiful - beaches, mountains, endless greenery and the occasional rainbow. We had easy access to Tunnels beach to sunbath and snorkel and Ke'e beach to watch sunsets over Na Pali. It is a short drive to the small town of Hanalei for restaurants, local shopping and groceries. We would definitely stay here again ! Aloha. Beautiful, serene home near the beach. What a find! We stayed at this home for two nights during our week long honeymoon and we were very impressed! The home is very clean and provides many amenities (we especially loved the beach gear). The location is perfect. Just ten minutes to the Kalalau Trail and from the town of Hanalei and Princeton. Although the ferile roosters in the area did wake us up, the home provided us with ear plugs which helped. I would definitely recommend this home to couples looking to get away and relax. A relaxing spot on the beach. Tucked away within view/sound of the surf. Great to visit this end of the island. Less developed and great for an escape. We can also split payment into multiple installments if need be. If you have any other questions or special requests please reach out to us, and we will be happy to work with you.